Home » Tech Tips » Windows 10 » How to Edit Hosts File in Windows 7, 8 and 10? How to Edit Hosts File in Windows 7, 8 and 10? 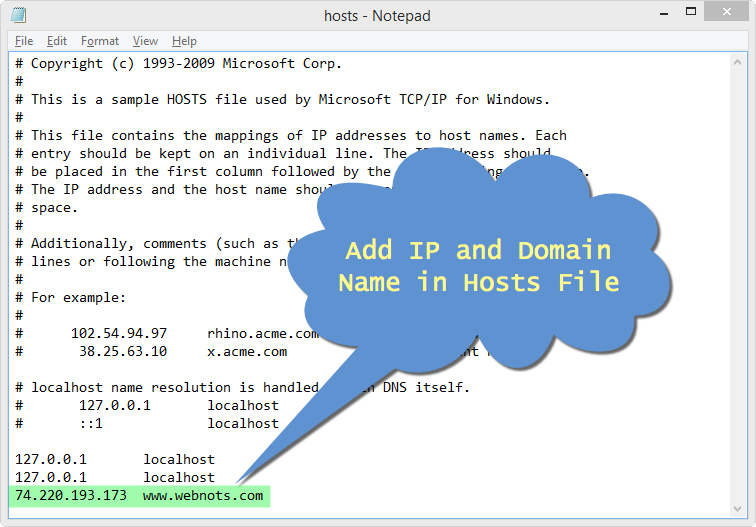 Hosts file is a local file available as part of an operating system and used to map IP addresses corresponding to domain names. The browser then resolves the entered domain name into an IP address found in the hosts file before using browser’s DNS settings. There are two major need for users to modify hosts file. Eliminate the resolving host time through normal DNS resolution. Block certain domains by pointing it to local host IP address. In both cases you need to create additional entries in hosts file and this article explains how to edit hosts file in Windows 8 and 8.1 operating systems. The procedure remains same for both in Windows 8 and 8.1. Click on the “Start” button located at lower left corner. 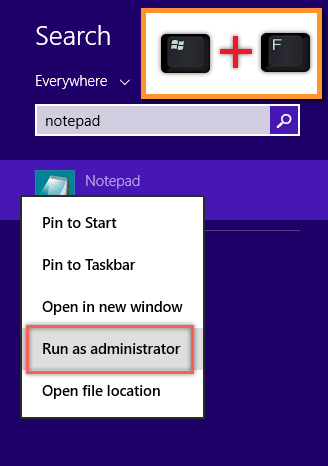 Right click on “Notepad” app and click on “Run as administrator” option. You can also use a shortcut “Windows Key + F” to “Search” for “Notepad” app. 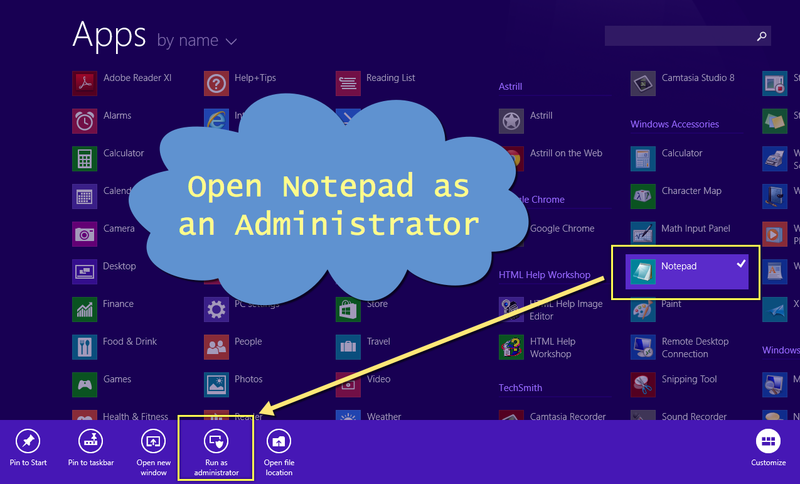 Right click on the “Notepad” and select “Run as administrator” option. 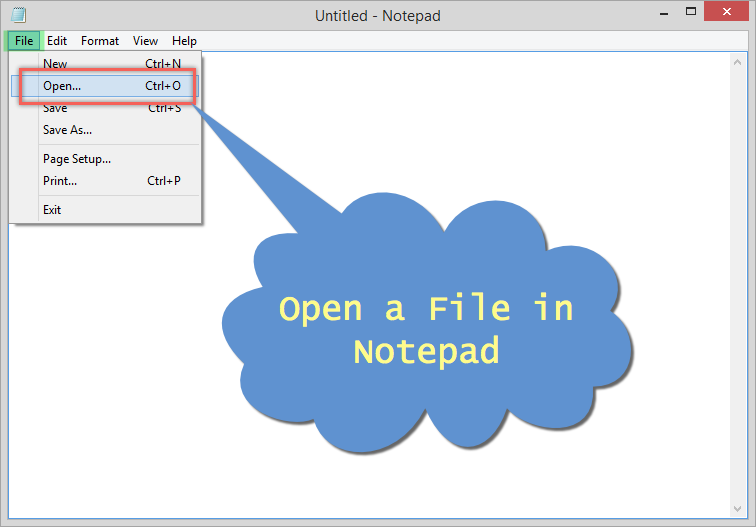 Once Notepad is opened in administrator mode click on “File > Open” from the menu. Hosts file in Windows 8 is stored in the location “C:/Windows/System32/drivers/etc/”. Go to this path and open the hosts file in Notepad. Select “All Files” in the file name dropdown to view the files in the folder. By default hosts file may not be visible under file name as text documents. Add required entries in the hosts file and save the file. Though tab is used to separate IP and domain, a single space is sufficient between IP and domain name. Add each set of IP and domain in a separate line. Add domain and subdomains separately. For example, webnots.com, webnots.com and blog.webnots.com needs to be added as three separate lines though IP address could be same or different. Use # to add comments in the hosts file. Hosts file does not have any extensions, hence ensure to save the file as “All Files” type and not as a text document with .txt extension. Once hosts file is changed, restart the computer for the changes to take effect. Here, 127.0.0.1 is the IP address of the localhost for IPv4, in case of IPv6 it should be ::1.